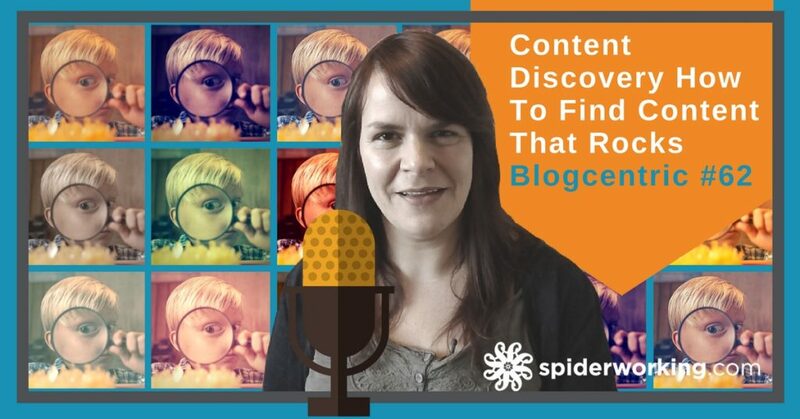 Content discovery is an important part of what we do as bloggers and marketer. Finding great content that inspires can make you a better writer, a better marketer and a better curator. But where do we start? 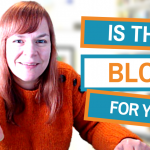 Small business bloggers face a problem. A good writer should read, a good marketer should curate content but how do we find content to read and curate? A few things happened over the Christmas break. If I didn’t know better I’d have said it was a cosmic sign. I finally got to read Stephen King’s book “On Writing”. In it he talks at length about the importance of reading if you are going to write. “1.) Unsubscribe (in all forms) from anything that’s not moving your goals forward. “News” is stupid. “Keeping up” is stupid. Pushing yourself forward is the real work. Growth. If you’re not subscribed to Chris’s emails, why aren’t you? Sign up here. The third thing wasn’t really a happening at all. I finally got so annoyed with the disruptive ads on one particular site that I subscribed to that I unsubscribed. It felt great. Whilst I was there I decided to have clear out of all the sites I subscribed to that no longer or rarely published anything worth reading. Stephen King is right, you have to read to become a better writer and I read a lot, I read books, every morning I read the blogs and news sites I subscribe to. Reading helps me write. I also know that Chris is right. The low-quality content from the blogs I subscribe to was getting in the way. After my clear out I’d open up my Feedly (more on that in a while) and instead of hundreds of new stories there were less than 50. It was much easier for me to find what I wanted to read. But there was a hole. Now I’d cleared out the rubbish I wanted to fill the space with more, better quality content. So I went hunting. 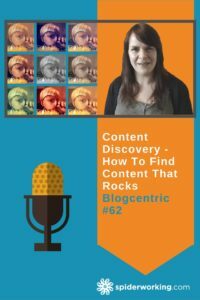 I thought I’d share my content discovery process with you today. How can you find interesting, inspiring and valuable content, not just articles but videos, podcasts and what should you do with it when you do? When I started putting this post together I realised that it could quite easily end up being a long list of tools. I’ve collated quite a list. I’m going to highlight my favourited below but after the meaty bit of the post I’ll add the full list. Before you start looking for content you need to ask yourself a few questions. 1. What do you want to read/watch/listen to? Content that will enhance your life? Motivating, inspiring and really useful content? You might want be looking for all three of these types of content, just one type or something completely different. The purpose of this exercise is to define what you are looking for before you start searching. 2. What are you going to do with that content you find? Are you just looking to read and be inspired? Are you looking to up-skill and learn? Are you looking to break out of your bubble and find content that challenges your ideas and opinions? Are you looking for content that you can curate and share on social media sites? Google Alerts has been my starting point for finding new blogs and content creators for as long as I can remember. If you aren’t familiar with it, it’s a tool from Google that sends you search results relating to a specific keyword or phrase every day. Go to the site, enter a keyword of phrase that you are interested in and it will send you a daily email with a list of articles and webpages that it has found. This is handy but you’ll find your email inbox fills up pretty quickly and you’ll stop looking. 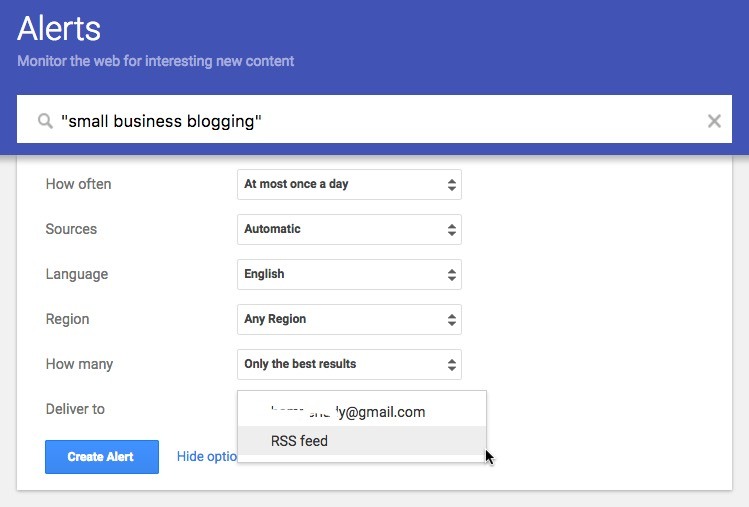 To get value from Google alerts you should pair it with an RSS reader. Enter Feedly. Feedly lets you subscribe to the results that Google alerts finds. Instead of having to wade through all those emails you can visit the Feedly site, or access the results via their app. Find out more about Feedly & Google Alerts here. Google Alerts will find a lot of results, it’s your job to find the gems. And once you’ve found a gem, a blog or website that produces consistently good content you can subscribe to that blog in Feedly. I recommend setting up separate folders in Feedly for Google Alerts and the blogs you want to read on a regular basis. This way you can filter the results to just the cool blogs if you are overwhelmed with stories from the alerts. That’s the problem with Google Alerts, the sheer volume of results. What you need if you want to retain your sanity is a tool that can help you discover the really good content. A tool with an algorithm that understands what you want. Our Facebook feeds are designed to show us the content that is most interesting and relevant to us. 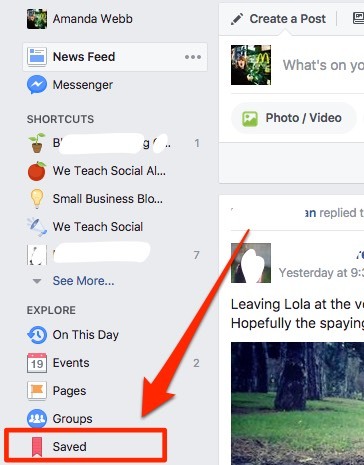 We can subscribe to as many business pages, blog pages, and news pages as we like, Facebook will only show us what it considers the best. Even if our feed is full of amazing interesting and inspiring stories we don’t always have the time to read them. We’re often taking a sneaky look at Facebook when we should be doing something else, or passing the time whilst we wait in a queue. We are already feeling guilty about spending time on Facebook when we’re supposed to be doing something else so we scroll by. But don’t. Before you scroll use Facebook save. When you sit down to read your quality content it will be there under the save tab. 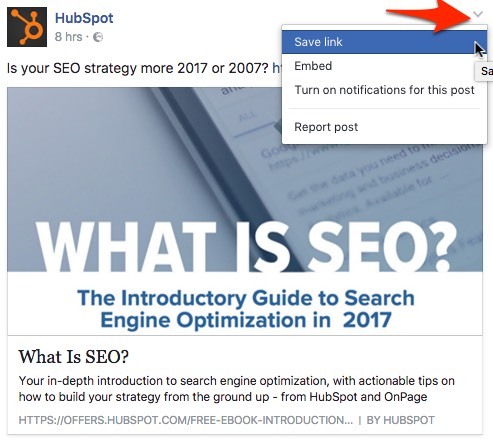 If you find a site producing consistently valuable content add it to your Feedly account so you don’t have to rely on Facebook showing you content from that site again. Twitter doesn’t have an inbuilt save function but ‘Pocket’ will integrate with your browser and phone and allow you to bookmark links from Tweets and other pages you visit to read later. The browser extension for the web adds a Pocket icon under your Tweets, just click it to save a tweet containing an article to your Pocket. I love this tool, whenever I have a spare moment I can dip into the content I’ve saved either via their website or the mobile app and know there is something worth reading. 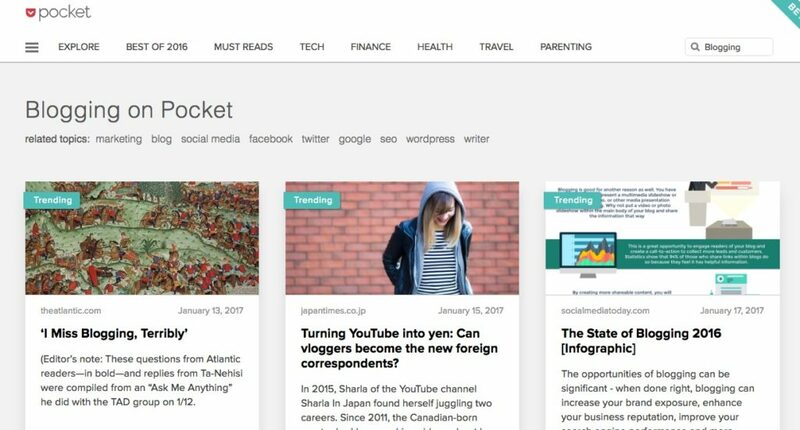 Pocket isn’t just for bookmarking, it’s recently added an explore tab that lets you find articles that are of interest to you. I thought I’d give it a try. 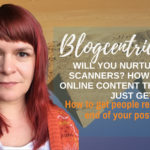 When I told it I was interested in ‘Blogging’ it found me a bundle of articles, some were quite old but many were well worth the read. I think I may have found some new content sources already. LinkedIn is a surprising source of interesting reads. 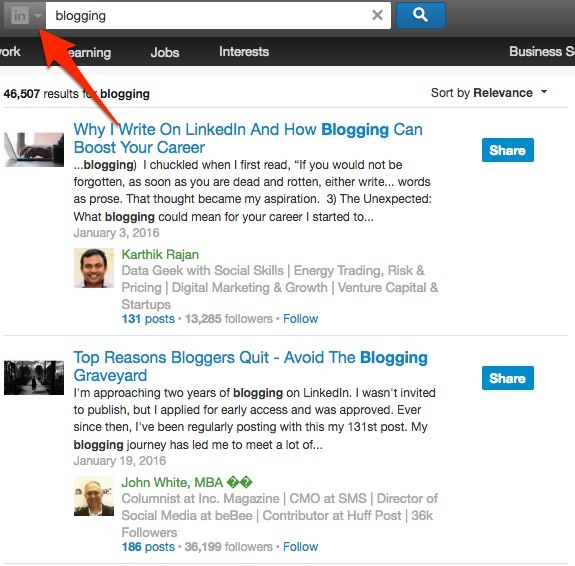 Because users can now effectively blog on LinkedIn using their publishing tool you’ll find a lot of content there that doesn’t appear elsewhere. Click the list icon to the left of the search bar and then type your topic into search. You’ll get a list of posts relating to your search term. LinkedIn automatically orders results by relevance but this can show you some out of date results. You can change the filter to recency if you want to see more. If you find someone who is posting good stuff you can follow them or add them to your connections. If you haven’t discovered Medium yet take a look at it now. 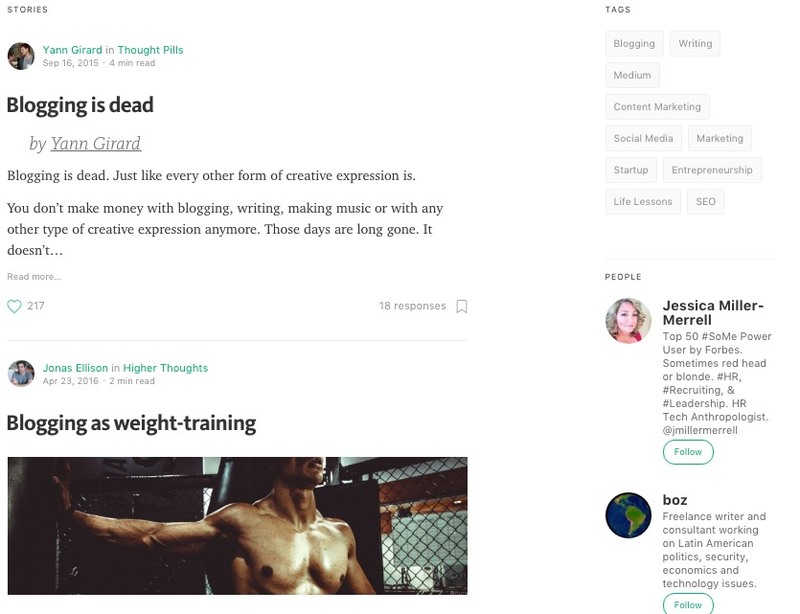 Medium is a cross between a blogging platform and a social network. You can search results by topic and you’ll find some interesting stuff. When you find something you like you can read it now, share it on Twitter or Facebook or save it to read later. If you are on the look out for something completely random ‘Reading Roulette’ in the sidebar offers random selections from the site. If you find someone producing consistently good content you can follow them and see their content in your feed when you log in. 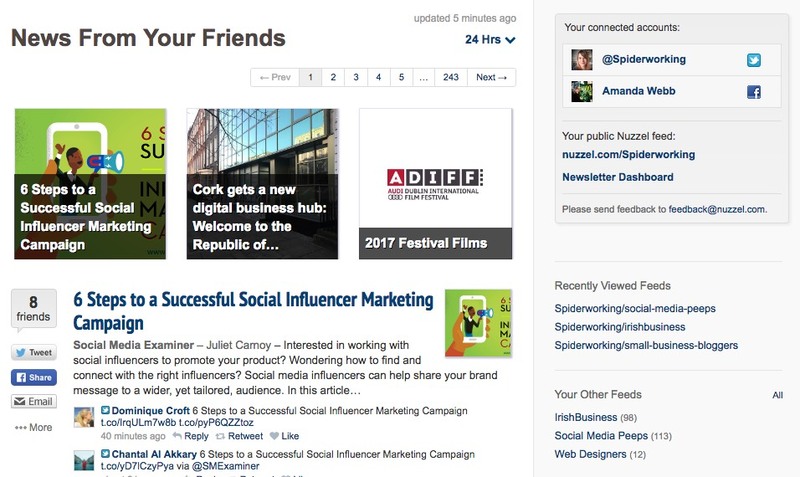 Nuzzle is a content discovery tool that hooks into your Twitter and Facebook accounts and identifies articles that are getting shared by your friends there. The idea is that these stories will be more relevant to you because your friends are recommending them. Results are prioritised by the number of friends sharing those stories. I was surprised to discover the popular stories I was missing. 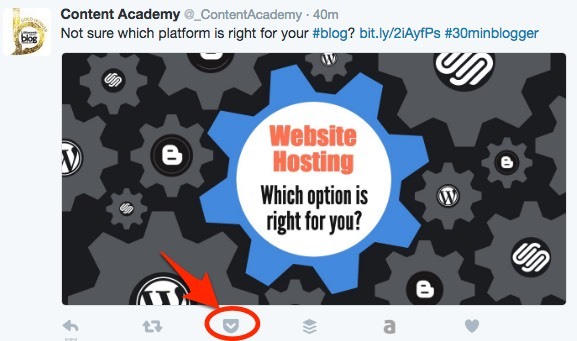 You can broaden your results by selecting stories from friends of friends or narrow it by selecting a Twitter list. That’s just a small selection of the content discovery tools available. I’ll link to more in the show notes. But the sheer volume of tools presents us with another problem. How do you find time to log into all these websites? 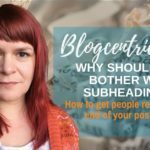 The first thing to remember is that we are using these tools to help us identify the blogs we want to subscribe to on a more regular basis. 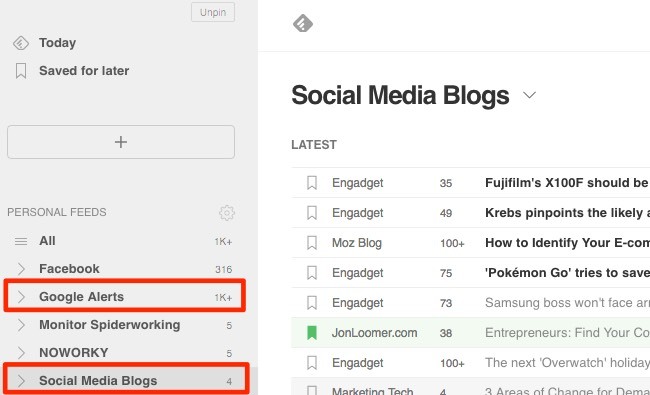 Once you’ve found the good ones you can add them to Feedly. Your Feedly account will become your daily content newspaper. I read mine over breakfast. Now you need to decide how often you are going to look at the other tools and sites. It doesn’t have to be daily, if you looked every day you’d have little time for anything else! I recommend allocating time once a week or once a month to look through these sites. When I cleared out my Feedly account after getting Chris’s email I found blogs I’d been subscribed to for years, that had been uninteresting to me for years, whose content I’d scroll through and tut as I’d pass. Avoid making my mistake and schedule a monthly clear out. We wouldn’t let a pile of old newspapers fill our homes, we wouldn’t keep the junk mail that comes through our letter boxes so why do we allow our digital feeds to fill up? Find time once a month for a clear out and find new and interesting content to add to your feeds. Well obviously you should read the content you find. Don’t feel like you have to read it all, just the stuff that appeals to you the most. Allow yourself to be inspired by it, if Stephen King is right you’ll become a better writer. If you’re generous you might want to share the good stuff too. Show your followers that you find and read good valuable content that they might like. And finally, if you are short of blog content why not start a weekly roundup post, sharing your top reads of the week. I hope I’ve inspired you in the same way Stephen King and Chris Brogan inspired me. In fact I’m hoping you’ll add me and this podcast and my blog to your Feedly so you don’t miss an episode or post. “29% of respondents said that finding and sharing quality content” was a challenge. 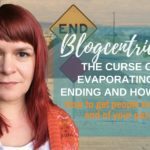 Use the tools I’ve outlined in this podcast, in the show notes and of course Post Planner to help you overcome that challenge. As promised, here’s a long list of content discovery tools recommended to me. Do you believe in Karma? If so I recommend that you go over to iTunes or Stitcher and leave a review on this podcast. You never know what wonderful things might happen in return.